Isn’t there something gratifying about using a food in it’s entirety that would otherwise be partially wasted; ground egg shells for the chickens, homemade bone broth from leftover beef bones, and fertilizing your tomato plants with banana peels? 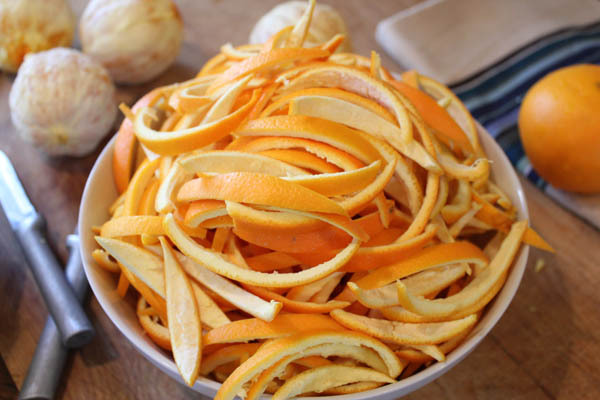 How about using citrus peels? These gorgeous candied orange peels taste as good as they look -almost like gumdrops – and provide some unexpected benefits too. Orange, lemon, and grapefruit peels contain about 5-10 times as many vitamins and minerals as the juice of the fruit! That’s a big boost of extra vitamin C, plus some special nutrients that aren’t found in the flesh of the fruit at all. Orange peels contain tangeretin and nobiletin — flavonoids that prevent cancer, diabetes, and reduce inflammation. In Chinese medicine, orange peels are used to improve digestion, relieve intestinal gas and bloating, and resolve phlegm. 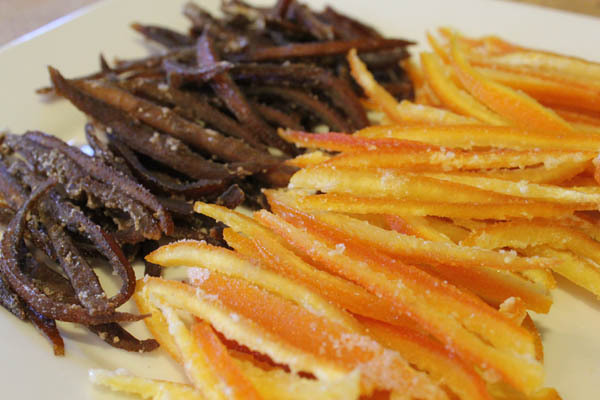 So candied orange peelings may even be medicinal, right? 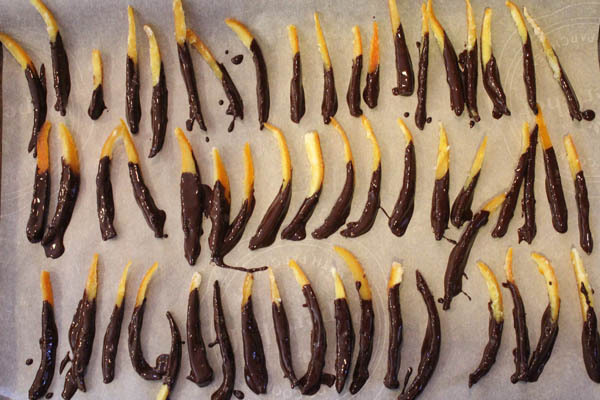 We made two batches of candied orange peels; one using plain white sugar and the other, rapadura. I was surprised that they were almost indistinguishable taste-wise, although the brown color of the rapadura version wasn’t nearly as pretty as the white sugar. Maybe the entire peel could be dredged in chocolate to disguise the color? Of course, rapadura makes these quite a bit healthier, since rapadura retains all of the natural vitamins and minerals found in sugar cane. We used orange peels here, but you could do this with grapefruit, lemon, minneola, or any other kind of citrus fruit you want. Lemon and chocolate are a classy combination, and we think grapefruit might pair well with a white chocolate dip. 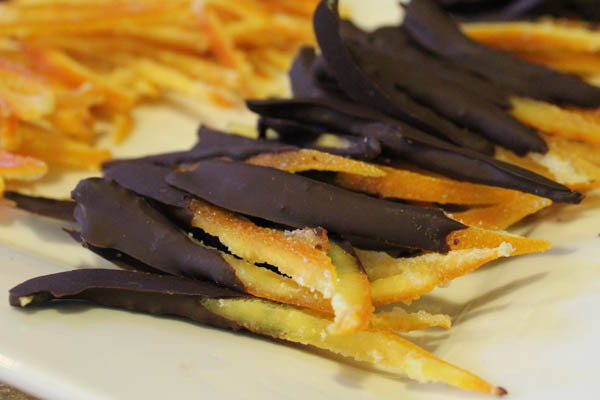 Candied citrus peels are easy to make and don’t require any special equipment. We dried ours in a dehydrator to speed the drying process, but they can be spread out to dry at room temperature as well. Without the dehydrator, we found it’s best to give them a full two days to dry, so plan some extra time if you’ll be doing it this way. Eat them plain for no reason, or for a special Valentine’s Day treat. 1. Score each orange in quarters and remove the peel from each section carefully. 2. Slice the peel into 1/4 inch strips. 3. In a medium sized saucepan, cover the orange peels with water and bring to a boil. Drain and repeat up to 3 times. The more times you repeat, the less bitter the rind will be. We did this three times, and they turned out delicious, but I think once or twice would have been enough. Just taste them to be sure if you want to cut corners here. 4. Combine the 2 cups water, 1 cup sugar or rapadura, and orange peels in a saucepan. Bring to a boil over medium heat, and simmer for about 30 minutes. 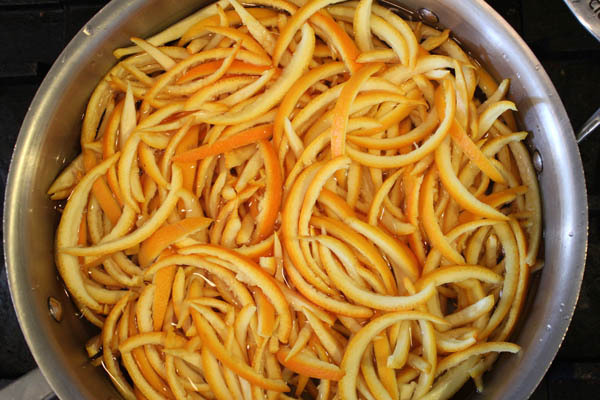 Drain through a colander, reserving the orange flavored syrup for another purpose. 5. Toss the orange peels in additional sugar to coat. 6. 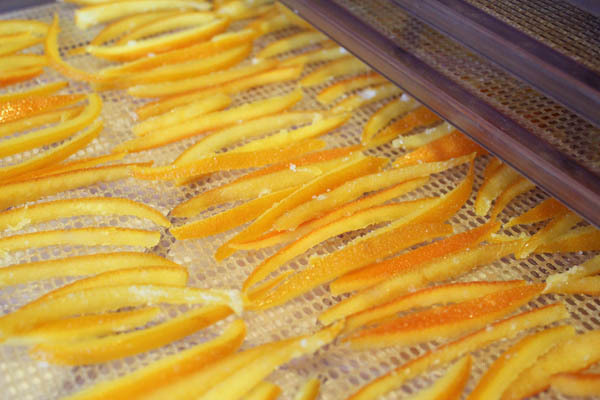 Spread the orange peels out on a drying rack to dry OR lay them out on dehydrator sheets. It takes about 2 days to air-dry the orange peels. Mine took 2 hours in a dehydrator set to 130 degrees. 7. 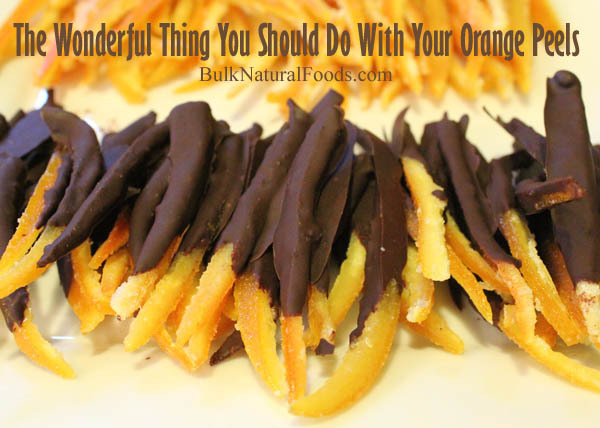 Once the oranges are as dry as you’d like, you can eat them, store them, chop them for a recipe, or dip them in melted chocolate. Sweeten your tea with it. Drizzle over vanilla ice cream for an orange Julius sundae. Use as a pancake or waffle topping.